Shouldn’t mothers take care of themselves first? A study finds that Indian mothers are 36 times more likely than their peers in Australia to agree that ‘the child always comes first’. A very large number of mothers in the US (82%), said that post delivery there is a shift in the focus. The health of the child becomes a priority. The focus shifts from the mother’s health. The culturally reinforced thinking that it is all about the baby gets resonated through the study. Therefore, brands have a tremendous opportunity, to teach mothers about the value of putting themselves first. 75% of all mothers state, they cannot resist comparing their child’s development to that of other kids. This was found to be 90 percent in China. And when it comes to Indian mothers. They don’t just compare, they are also the most anxious and obsessed in regards to comparing their kid’s development with other kids. Majority of mothers in India and China encourage their kids to reach milestones earlier than schedule. As compared to 82% of respondents globally. Normally it is said kids should learn at their own pace. A concern which emerged – Is tech good for kids? 60% of respondents across markets said kids should not be exposed to technology at an early age. 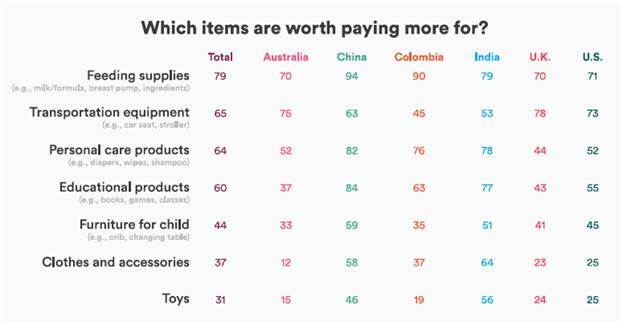 Only with China being the opposite with 60% encouraging early use of technology. 62% in India felt it could be harmful. Brands and marketers should take a note of the differing perceptions across markets. Over 50% expecting Indian mothers are concerned over their ability to take proper care during their pregnancy. While 30 per cent mothers said it was even harder to do so after the child was born. (9 out of 10 Indian mothers were living in an extended family set up, with 74 percent living with their in-laws). The top pick – Personal Care, Educational Products, Child Furniture, Clothes and Accessories, and Toys. The above is a curated content from the study titled ‘Global Motherhood Survey’. Mothers which were either expecting or had a child below 2 years of age were part of the group.